This article contains steps to fix the problem where floor accessibility does not applicable to the floor accordingly. › After configure floor accessibility for XP-SNET for lift controller the floor accessibility does not work, the user can still access all floor. › User still can access the floor which have given no access right. › Incorrect wiring connection at relay board. › Incorrect Floor Relay Setup at xPortal Server. › Incorrect Floor Accessibility Setup at xPortal Client. › Make sure your wiring connection from controller to relay board is correct. 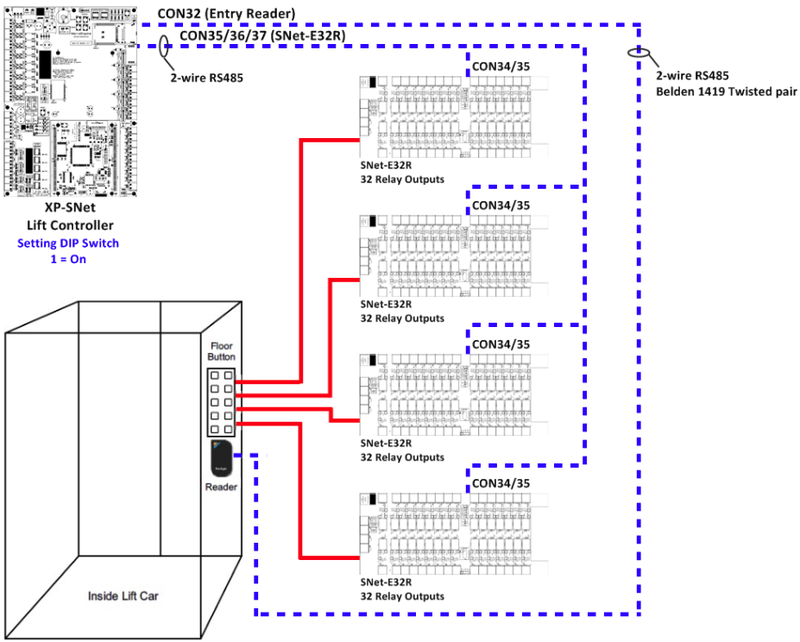 › Make sure all relays are correctly connected. › Please make sure the server setup are correctly configured. › Please make sure the client setup are correctly configured. Please check your wiring connection from XP-SNET controller to the SNET-E32R extension board is correct. Refer to Figure 1 below. » For high resolution image, please download the attached wiring diagram at the end of this article. This is an example of wiring connection diagram for 1 Lift Controller connected to 128 floors. 1 SNET-E32R = Support 32 floors. 1 XP-SNET Lift controller = Support 128 floors (Maximum can connected to 4 units of SNET-E32R). Make sure CON35/ 36/ 37 at XP-SNET controller is correctly connected to CON34/ 35 at SNET-E32R. Make sure the floor relay setup is correctly configured at xPortal Server software. See AA-00300 to configure the setup at xPortal Server. » If you connect more than 1 SNET-E32R board, make sure you set the board address and relay number correctly. Make sure the floor accessibility setup is correctly configured at xPortal Client software. See AA-00301 to configure the setup at xPortal Client. Summary: This article contains steps to fix the problem where floor accessibility does not applicable to the floor accordingly.